Hindus regard Mercury as God Keshav, Narayan, Madhav etc. In other words it represents protective agency. It is a prince in planetary cabinet. Its chief domain is over mind, memory, intellect, intelligence, perception, knowledge, reason, fertility of resources, commerce and education, powers of speech and writing, ability for editing, art of painting and sculpture. It gives the person ready wit, an easy acquisition and command over many languages, taste for and competence in philosophy, mathematics and accountancy. It rules over central nervous system. It is a planet of intelligence and is responsible for retentive power and reproductive ability. It makes one talkative, witty and learned. For intelligence/ Studies and appease planet Mercury . It is to appease the planet Bhudh or Mercury. 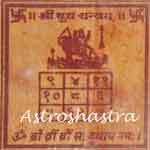 When Mercury is malefic, the use of this yantra is very benefic and favourable. It protects from fire and electric loss etc. It is specially favourable for a pregnant woman against abortion and for the safe delivery of child. It is embossed on Copper plate with Gold Plating and is to kept on rising moon Wednesday. Those having the problem of stammering and speech , shall perform daily puja to this yantra. If Planet Mercury is in conjunction with any malefics like Sun , Mars or Sarturn or horoscope with combust mercury shall perform puja of yantra to strengthen Mercury in chart. 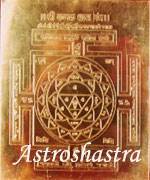 Astroshastra provides the Yantra in Gold plated copper plate, silver as well as Bojpatra. We also provide it in silver pendant to be worn around neck. Astroshastra provide Bhudh or Mercury Yantra in Bojpatra in two sizes and in copper plate with Gold plating. 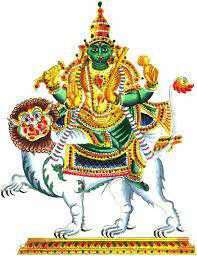 Those having malefic Mercury in sixth, eighth or twelvth house of the horoscope shall also keep it with them to appease planet Mercury. We provide energized Yantra customised for specifically for you to give you best results. 1. It harmonize the planet mercury in the Horoscope. 2. It improves intellect and Memory. 3. It helps in correcting Speech Defects. 4. Mecury is the planet of Business and its correction improve Business.
" Om Braam Breem Broom Sah Bhudhaya Namah"